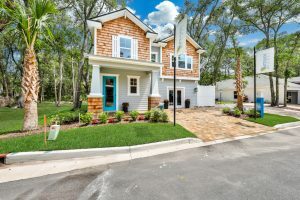 If you are considering a vacation home, our newly built homes in Shell Cove are located on the Amelia Island Greenway and are only a short half mile stroll from the spectacular white sand beaches of Amelia Island and Fernandina Beach. Shell Cove is a 20-minute drive from Jacksonville International Airport and is close to local shopping and restaurants in Fernandina Beach’s Historic Downtown. Shell Cove includes 48 home sites which are designed around maintaining a beautiful streetscape while offering efficient floor plans for the lowest price of any Amelia Island new construction homes. With very little opportunity for future on-island developments of this nature, Shell Cove will be one of the last new home communities of this size to be offered at its price point, all within a close proximity to the beach. Artisan Homes feature master craftsmanship, timeless design, and energy efficient living, designed and built for your family’s lifestyle. Our goal is simple: “Provide homebuyers with a high-quality experience, while creating the home of your dreams.” Our entire team of experienced designers and builders will guide you through the process every step of the way. If you are looking for home builders on Amelia Island, FL, contact Artisan Homes today! Shell Cove is one of our largest new home communities in Fernandina Beach, FL. With plots still available, there will not be another community constructed in this area with the wide variety of new homes to choose from at the price point that Artisan Homes offers. We pride ourselves on over 75 years of combined experience in the Fernandina Beach new home construction industry and boast a process that is tried and true to ensure an unblemished process for our customers. With high-quality material, unmatched craftsmanship and customer service that we pride ourselves on, we offer a process that is sure to accommodate your every need. If you are interested in existing new home construction you can learn more about our communities in Northeast Florida. With ample sunshine, close proximity to the beach and a vibrant community atmosphere, Shell Cove in Fernandina Beach could be the perfect choice for your new home construction needs. Located just 20 minutes from the Jacksonville airport, this convenient location is adjacent to the historic Fernandina Beach downtown area. As experienced new home builders in Fernandina Beach, we offer a process that ensures your needs, wants and desires are all met while paying attention to the minute details that will make you proud of your new home. Our customized process has been crafted to make sure that you receive the home of your dreams while ensuring a stress-free experience throughout each step of construction. We have put thought and consideration into each important milestone of our process and our past customers have praised us for providing such comprehensive customer service. Trust in Artisan Homes to provide you with a new home in Fernandina Beach that you can rely on. Contact Us today to learn more!